Traditional Hot Cross Buns with a cream cheese icing, brushed with a sweet syrup and filled with juicy raisins. Soft, fluffy, sweet and sticky, a must have for Easter brunch. It that time of year again where my oven is getting a workout. I’m starting off with my easy recipe for hot cross buns which I’ve been making for years. It’s a favorite in my family. These buns are sweet and sticky and topped with the best cream cheese icing there is! A few other highlights to look for in this recipe are the rum soaked raisins and the rum glaze! 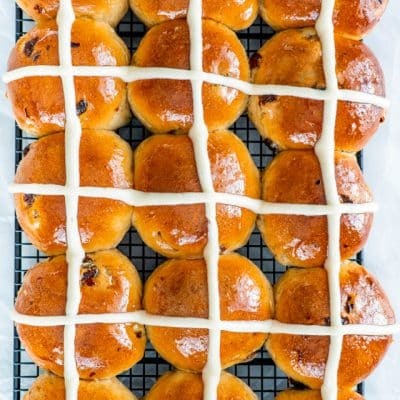 These delicious glazed little buns are traditionally served on Easter. The cross is, of course, representative of a cross, and the bun represents the end of lent. 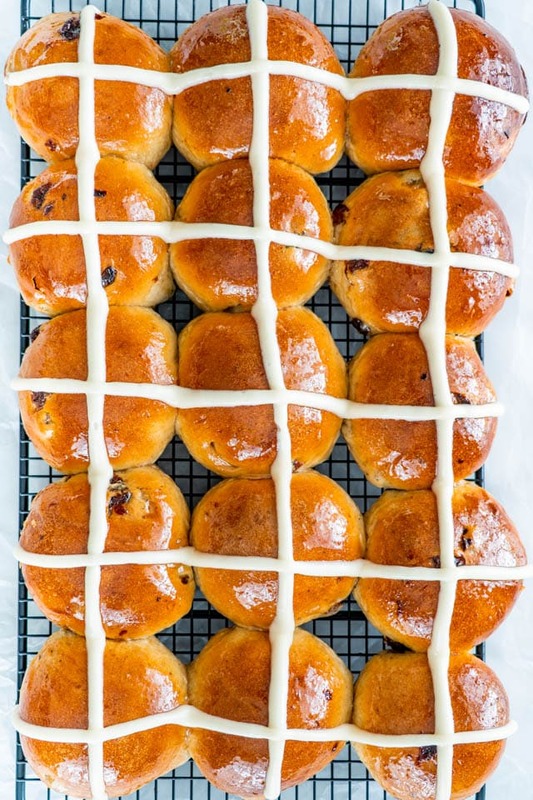 Whether you celebrate Easter or not, these buns are so fantastic and can be enjoyed by everyone! I love these buns, they are so soft, flaky and sweet, they melt in your mouth. This dough is perfect in every way. You may think I’m weird but I get very excited by dough. Dough to me is like gold, especially this kind of dough that makes these wonderful flaky rolls. They would even be perfect for a bread pudding with leftover buns the next day. Oh and how great they are with a hot cup of milk, or a hot cup of tea. These here, simple perfection. I really think in my other life I was a baker! Salt – You need a little bit of salt in these buns to bring all the flavors together. You can use less or more if you prefer. Milk – I used 2% milk, but you can use skim, 1% or homogenized. Granulated sugar – You can add a little more or less sugar if you’d like. 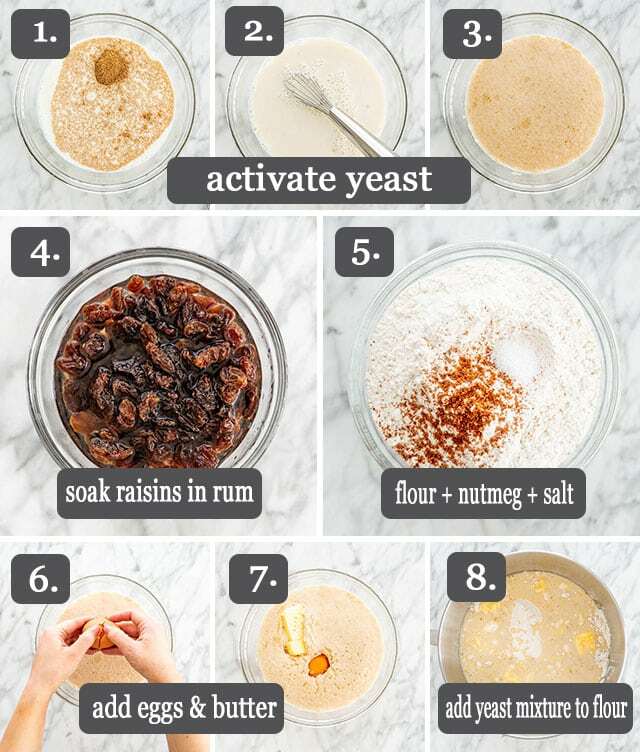 Active dry yeast – this needs to be activated in the milk and sugar. If you’re using instant yeast you do not need to activate it. All-purpose flour – If you use whole wheat instead, use only 3 1/2 cups. If you use gluten-free flour, use xanthan gum to replace the gluten or your buns will turn out dry. Nutmeg – You can adjust how much nutmeg you use, but if you have nutmeg seeds, I strongly recommend freshly grating some. It makes a whole world of difference to your buns. Eggs – I used large eggs for this recipe. Raisins – You can use any raisins, you have. 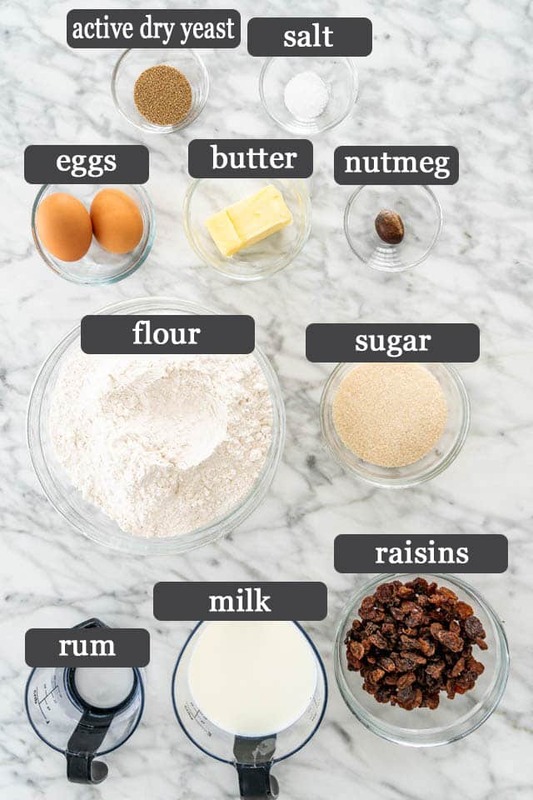 Rum – this is optional but I use it to soak my raisins in it. I use the leftover rum to make the glaze. Water – You can use more or less water depending on the consistency you’re looking for. Since it’s a glaze, I’d suggest keeping it thin. However, I used the rum from the raisins to make the glaze. Up to you. Granulated sugar – You can substitute an equal amount of honey or agave. Icing sugar – This is also known as confectioners’ sugar or powdered sugar depending where you’re from. 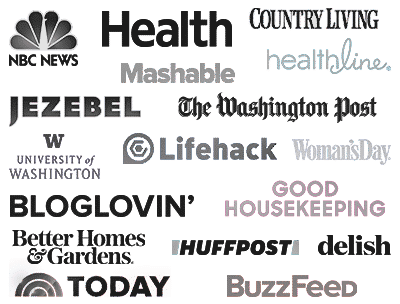 Cream cheese – You can use low fat, full fat, or vegan cream cheese. Butter – Make sure your butter is unsalted and room temperature so it’s easy to mix in. Vanilla – You can use vanilla extract or vanilla paste. Water – I used a bit of water to thin it out so it was easier to pipe onto the buns. You can also use milk or leave it out if you like a thicker icing. 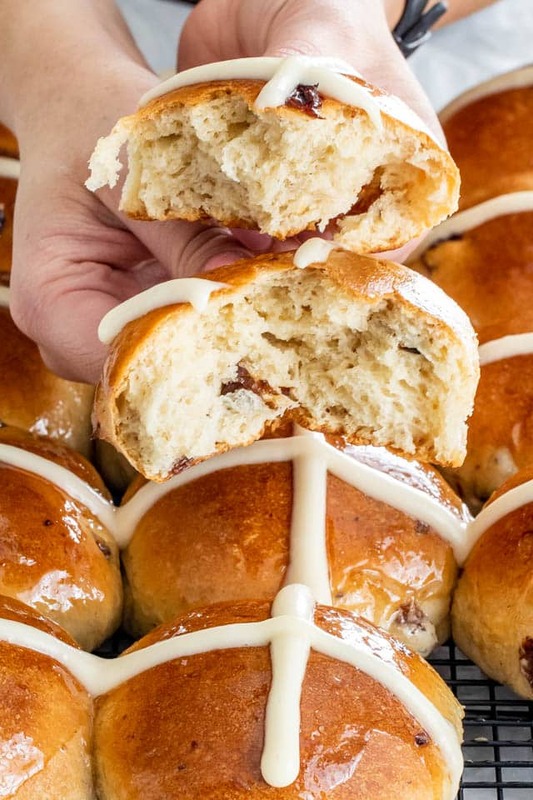 I love my hot cross buns on the sweeter side so I always like to make the crosses with icing rather than the more traditional way of using a flour and water paste. Totally up to you how you do it, be sure to check out the recipe notes for using flour/water paste. Activate the yeast: In a small bowl combine the lukewarm milk, sugar and yeast. Stir and let it rest for about 10 minutes until the yeast activates, you will notice bubbles forming. Prepare the raisins: This step is optional but you can soak the raisins in rum, preferred. Make the dough: Add the eggs and butter to the yeast mixture and stir. Pour the yeast mixture over the flour, and using the dough hook attachment mix for about 5 minutes. Add raisins and continue mixing for another minute. If the dough is too wet add more flour as needed. The dough should be quite soft and elastic. You will know when it’s done when it doesn’t stick to the sides of the bowl anymore. Rise the dough: In a large bowl add a bit of oil, about a tbsp and place the dough in the bowl, rolling it around so that it gets oil all over, this way it won’t get dry. Cover the bowl with plastic wrap. You need to let the dough rise for a couple hours until doubled in size. You can also do my trick where I turn the oven on for about 1 to 2 minutes just until it’s warm, place the bowl in the oven, close the door, make sure you turned off the oven and in about half an hour the dough would have doubled in size. Form your buns: Use a 16.5 x 11 inch baking sheet and line it with parchment paper. Sprinkle flour over the top of the dough, over your work surface, and on your hands. Shape the dough into a log and cut it into 15 pieces. Flatten each piece, pinch the sides all together, then flip the ball and roll it to smooth out the top. 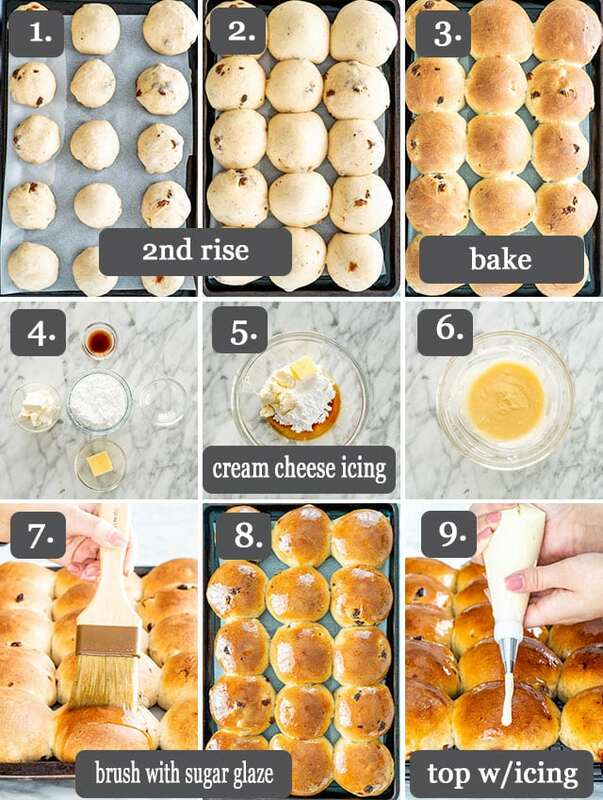 Place each bun on the baking sheet and cover it with kitchen towels and let the buns rise until they are about 50-70% bigger. Bake at 375F for 20 minutes, or until golden brown. Glaze the rolls: While the bread is baking, make your glaze. Mix the rum (or water) with the sugar in a saucepan and bring to a gentle simmer. Simmer until the sugar has dissolved. Remove the glaze from the heat and let it cool. Brush the rolls with the glaze right after they come out of the oven. Ice the rolls: Let the rolls cool fully. Whisk all the icing ingredients together until smooth. Using a piping bag or ziploc bag, pipe the crosses onto your rolls. Proofing the yeast before you get into the rest of the dough is key. If your yeast doesn’t foam up, no matter what the expiry date on your yeast say, the buns won’t turn out. Store your yeast in the freezer and it will last longer. However, if you’re using instant yeast, the difference between instant yeast and active dry yeast is that you don’t need to activate instant yeast. I still prefer to do this because it tells me if my yeast is good. This dough is meant to be sticky! Dough rises best in a draft-free, warm environment. You can preheat your oven to the lowest setting, then turn it off. That will create a wonderful environment for your dough. I prefer to use parchment paper over cooking spray to avoid unnecessary grease on the bottom of my buns. Yeast needs sugar to thrive and grow. You can reduce the amount of sugar in the dough, but don’t leave it out entirely. I Don’t Have A Mixer, Can I Still Make These? Great news! Try my No Knead Hot Cross Buns recipe, no mixer or any equipment necessary. They’re super easy to make and pretty much fool proof. If you have leftovers, store these in an airtight container or a large ziploc back. Because of the cream cheese icing I would keep these in the fridge. They will last about a week refrigerated. You can also keep some of them un-iced and keep them on the counter in an airtight container or bag so they don’t dry out as much. They will last 2-3 days at room temperature. Form them into rolls immediately after making the dough- don’t let it rise. Let them freeze on a baking sheet lined with parchment paper and then topped with plastic wrap. Once they are frozen solid, you can transfer them to a freezer bag. They will last about 2 weeks. To bake them, place however many rolls you need on a baking sheet. Cover the rolls and let them thaw and rise. You can place them in a warm oven to speed this process up. Once they have doubled in size, bake them as instructed. Once they have fully cooled, wrap them well with foil and store in an airtight container. They will last about 1 month before freezer burn starts to become an issue. Let them thaw fully at room temperature. In a small bowl combine the lukewarm milk, sugar and yeast. Stir and let it rest for about 10 minutes until the yeast activates, you will notice bubbles forming. 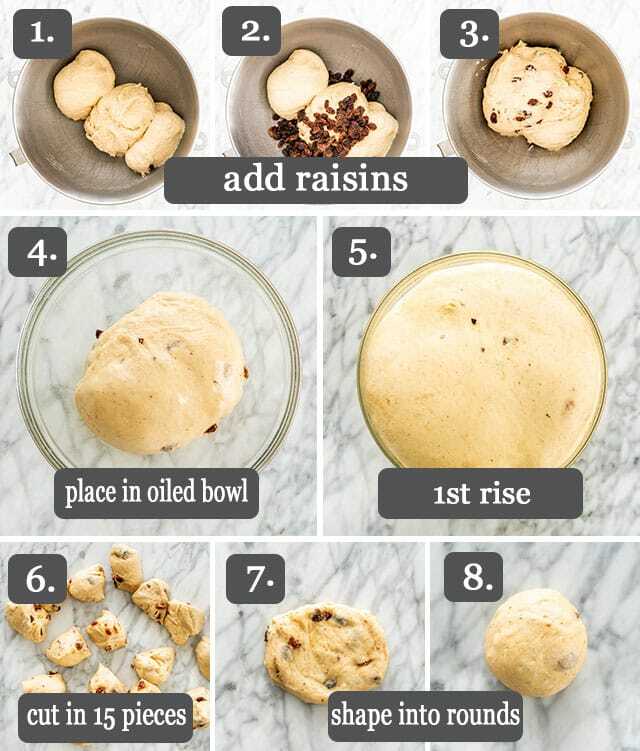 Soak the raisins in rum. This step is completely optional. If you're soaking them in rum, you'll need about 1/4 cup of rum. In the bowl of your mixer add 4 cups of flour, salt and nutmeg. Mix until combined. Add the eggs and butter to the yeast mixture and stir. Pour the yeast mixture over the flour, and using the dough hook attachment mix for about 5 minutes. Add raisins (drained if soaked in rum) and continue mixing for another minute. If the dough is too wet add more flour as needed. The dough should be quite soft and elastic. You will know when it's done when it doesn't stick to the sides of the bowl anymore. In a large bowl add a bit of oil, about a tbsp and place the dough in the bowl, rolling it around so that it gets oil all over, this way it won’t get dry. Cover the bowl with plastic wrap. You need to let the dough rise for a couple hours until doubled in size. You can also do my trick where I turn the oven on for about 1 to 2 minutes just until it’s warm in there, and place the bowl in the oven, close the door, make sure you turned off the oven and in about half an hour the dough would have doubled in size. Preheat oven to 375 F degrees. Line a baking sheet with parchment paper. I used a roasting pan that's 16x12 inches. Clean and flour your work surface. Usually I don't add any flour to my work surface because I find it easier to roll the buns on a clean surface, but it's totally up to you. Punch down the dough, and cut it into 15 equal pieces and roll each one. Place the rolls in the pan and cover with a clean damp towel and let them rest for another 30 minutes until doubled in size. Bake for about 20 or until golden brown. Mine were actually done after 17 minutes so keep an eye on them. While baking make the syrup by mixing the sugar with the water in a sauce pan and bring to a boil over low heat. Continue boiling for another minute or until syrup thickens a bit. Set aside. When the buns are out of the oven, brush with the sugar syrup. Let cool completely before piping the icing over the buns to form a cross. For a NO KNEAD version try these NO KNEAD HOT CROSS BUNS. 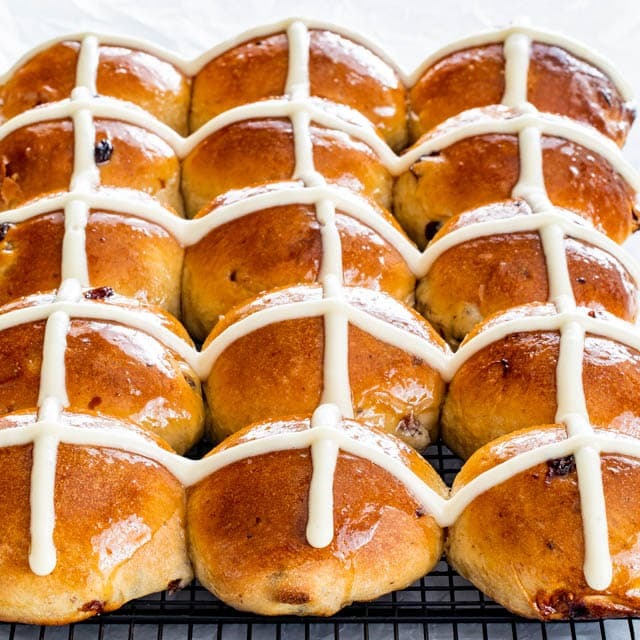 Crosses: Traditionally the crosses on hot cross buns are made with a flour and water mixture, not icing. If you want to do this, whisk together about 1/2 cup of flour and 5 tbsp water until a paste forms. Transfer this to a piping bag and pipe crosses on the buns before baking. You can prepare these the day before up until step 4, cover the pan with plastic wrap and place it in the fridge overnight. The rolls should continue to rise in the fridge but if by morning they have not doubled in size, turn your oven on to 200 F degrees until it warms up, then turn it off. Place the pan in the oven for about 30 to 45 minutes until the rolls double in size. Then you can bake them as instructed. You can use the kneading function! You’ll have to roll the buns out and bake them as per the recipe. Hello! 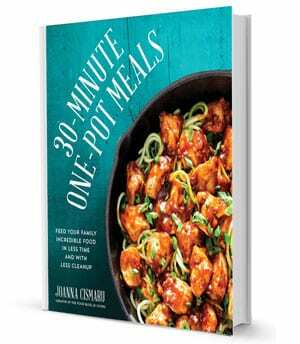 Excited to try this recipe. I haven’t made a lot of bread. Question: I will be using my Kitchen Aid mixer, what speed do you use to mix the dough? Thanks. We start it slow, then once most of the flour is incorporated we’ll increase the speed until it’s around the middle! Love this recipe. How do we store them after baking and how long do they keep? The cream cheese icing will last 3 days in the fridge, so if you plan on making these ahead of time you can leave the crosses out until you serve them. Store in an airtight container or wrapped well with plastic wrap so they don’t dry out, and the buns will last for 4 days at room temp or 7 days in the fridge. Absolutely delicious! I made the buns smaller, and was able to get quite a bit more than 15! Had to reduce baking time just a bit because of their size. keep them fresh, and will share them at coffee hour. Thank you! These were delicious! I will make them a part of my regular repertoire. I made three batches of this dough recipe. It turned out scrumptious. Everyone loved them. Very proud of you! Thx you for this easy recipe. All I heard was, “Oh em gee – delicious.” “Ahhh, so great.” “Yummy – I want more.” Happy in Alaska. I loved these rolls the first year I made them! (I wasn’t able to make them last Easter due to nursing a baby with a dairy allergy. Ugh.) I can’t wait to make them again this year. When I made them, I made half with raisins soaked in water, and half with chocolate chips for those who don’t like raisins. They were quick and easy to make. I’m curious how long you set the raisins in rum. How long? What type/brand rum did you use? I’m excited to try this recipe for Easter dinner. We are a bread loving family and look forward to your delicious recipe. I used Captain Morgan, shouldn’t matter though. I probably set them for around 15 minutes, should be enough for them to get nice and plump and soak in some of them rum. I have been making hot cross buns for years. I am using this recipe right now for the first time ( I saw it on Facebook) and the dough is very easy to work with. I halved the sugar but also put in some lemon zest and matchstick-cut candied cherries. I am sure they are going to be delicious. I have never done a cream cheese frosting or a syrup glaze and I am sure folks will be asking for more. Your recipe tips throughout, plus notes at the end are very helpful for any beginner or experienced baker, so you are an excellent instructor! Thanks much for the share. Blessed Easter! My pleasure! Happy Easter to you! I tried 2 recipes before this one and yours is AMAZING. Super soft and just the right amount of spice. Tasted great even before the icing. Definitely, it’s traditional. As are orange and lemon peel, which go great with the currants. The cream cheese cross sounds yummy, very unusual.